The Ice House :: The Ice House 58th All-Star Anniversary Show - Classic Comedy with Stand-Up's Finest Comedians - including Paul Rodriguez, Wendy Liebman and more! 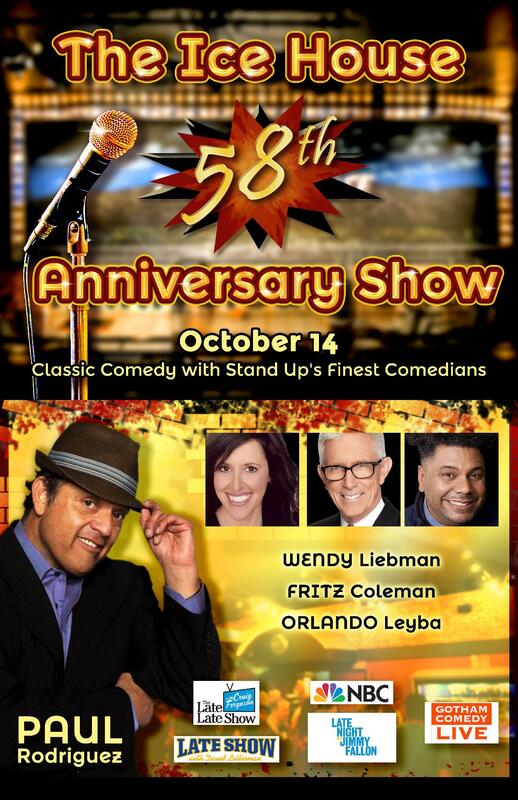 The Ice House 58th All-Star Anniversary Show - Classic Comedy with Stand-Up's Finest Comedians - including Paul Rodriguez, Wendy Liebman and more! The Ice House’s most anticipated show of the year returns when it celebrates it 58th anniversary with a spectacular all-star comedy show on Sunday, October 14 at 7 p.m. There will be a pre-show reception and silent auction from 5 p.m. - 6:30 p.m. and a live auction following the show. All profits from the show and auctions will benefit Hillsides, a non-profit group home in Pasadena. With PAUL RODRIGUEZ, WENDY LEIBMAN, FRITZ COLEMAN, ORLANDO LEYBA and more to be announced! ***$50 - PREFERRED SEATS - preferred, reserved seating and 2 tickets to a future show (a $40 value). ***$75 - VIP SEATS - Best seats in the showroom and 4 free tickets to a future show (an $80 value). Join us for a 3 Course Bistro Dinner before the show for just $24.50! Dinner includes salad, zucchini nut bread and choice of filet mignon, chicken, fish or vegetarian entrée. Dessert is pecan snowball cookies with chocolate sauce. Dinner will be served inside before the show. The Ice House opens at 5:30 pm for dinners. There is a two drink minimum per person in the showroom. Dinner must be purchased with show tickets in advance. Dinner times start at 5:30 p.m. - Someone will call you to confirm your dinner reservation time. As an accomplished writer, director and producer for television, motion pictures and feature shows, Rodriguez has several hit projects to his credit including the comedy concert film "The Original Latin Kings of Comedy," which he executive produced and starred in along with Cheech Marin, George Lopez and Carlos Mencia; the feature film "A Million to Juan," which he also wrote, directed and starred in; six comedy specials for HBO including "Loco Slam, " "Live in San Quentin" and "Idiots and Armadillos." As executive producer, he recently struck comedy again with his Comedy Central stand-up concert DVD, “Comedy Rehab.” In addition to his many hit comedy specials in English, Rodriguez has the distinguished credit of performing the first-ever one-hour standup comedy special in Spanish, "Dime Con Quien Andas," for Telemundo. Among his many credits, Rodriguez has also made guest appearances on several Late Night shows including "The Wanda Sykes Show," "The Tonight Show with Jay Leno," "Last Call with Carson Daly," and "Politically Incorrect." Additionally, he has guest starred in several television series including "Extreme Makeover: Home Edition," "Kathy Griffin: My Life on the D-List," "Shaken Not Stirred," DIRECTV’s "Supreme Court of Comedy," Showtime's original series "Resurrection Boulevard" and "American Family." He has also lent his voice to popular animated series including "King of the Hill," "Dora the Explorer" and "The Proud Family." Rodriguez’s first big break came while doing comedy warm-ups for Norman Lear's show "Gloria." Lear ultimately wrote and developed a weekly series for Rodriguez entitled "a.k.a. Pablo," which is enshrined at the Smithsonian and holds the distinct honor for being the first television show about a Mexican American family on mainstream American television. In addition to being a revolutionary and enduring force in the world of comedy, throughout his career Rodriguez has remained involved with various charitable, civic and educational organizations including the Hispanic Scholarship Fund, Juvenile Diabetes Foundation, Elizabeth Glaser Pediatric AIDS Foundation, League of United Latin American Citizens (LULAC) and The Leukemia Society, to name a few. He also is a member of the advisory board of the California Film Commission. Additionally, as part owner of the world famous Laugh Factory, Rodriguez has participated in the club’s annual free Thanksgiving and Christmas dinners for the underprivileged for over 30 years. Rodriguez was honored with the Humanitarian of the Year Award by the City of Fresno for his tireless work on behalf of water conservation. As Chairman of the California Latino Water Coalition, Rodriguez was one of the driving forces behind the California Water Bond Measure coming into fruition. Always willing to seize an opportunity to educate and entertain, Rodriguez can currently be seen in the nine-episode web series “Fixing Paco,” which is produced by The Mendez National Institute of Transplantation (MNIT). The innovative series launched in Spanish and English in November 2012 to help raise awareness on the importance of organ transplantation within the Latino Community. In addition to writing, directing, producing and performing across the country, Rodriguez enjoys spending time with his granddaughter Heaven, and his two sons Paul Rodriguez, Jr., aka as professional skateboarder and gold medal winner, P-Rod; and his younger son, Lukas. He also enjoys spending time with his three eccentric Chihuahuas – Mooska, Chica and Luna (formerly known as Lady Gaga), who Rodriguez adopted from an animal rescue shelter. For more information on Paul Rodriguez you can visit www.paulrodriguez.com. Wendy Liebman: Originally from Long Island, NY, Wendy Liebman started her career in Boston after taking a class at The Cambridge Center for Adult Education in How To Be A Stand-up Comedian. Since then she has been a regular on late night television, including Carson, Fallon, Letterman, Kimmel, Ferguson and Leno. Wendy has done half-hour specials for HBO and Comedy Central, and her first hour, “Wendy Liebman: Taller on TV” premiered on Showtime in 2011. Wendy has been in three documentaries: “The Aristocrats”, “The Boys: The Sherman Brothers’ Story,” and "Why We Laugh: Funny Women" recently on Showtime, and she was the recipient of The American Comedy Award for Best Female Comedian. Wendy currently co-hosts UNBOUND with Terri Nunn, on KCSN, 88.5 FM in Los Angeles. She also performs at clubs, corporations, and benefit shows throughout the US and Canada, and lives in Los Angeles with her husband, Jeffrey Sherman, her amazing stepsons and her funny dog. She was recently in New York Magazine, as number 23 down in the crossword puzzle.